How can we continue to hope and believe things are going to change? It’s only action that leads to change. Apparently, the action we’ve taken until now has led us to where we are today. Who will take the risk of saying that humanity or even the Earth itself is in a good position? Who will take the risk of proclaiming things have improved in the last 10 years, or 100, or 1000? At some point, we will have to call a cat a cat. We can’t keep on trying to describe without using its name. If we see the results of the actions we’ve taken have gotten us to where we are, we have to be retarded to think that things will get better if we don’t introduce a different way of doing things! If humanity can agree that we have to do things differently, the problem we seem to be having is figuring out what else we can try that hasn’t been tried before. History has shown it’s impossible for an idea to come to us out of nowhere as each successive generation inevitably falls back on the same set of ideologies to guide its march into the future. This experimental approach seems to be leading us in circles or, more precisely, a downward spiral. If we find ourselves in a room trying to fix something and we don’t have the tool we need in the room, we will have to go find the tool we need to fix it. We can’t keep trying to fix it with what we have that isn’t working. Is it because of laziness or fear that we have not stepped outside of the box that our society has given us to function in? Regardless of the reason, it’s clear that the options inside the box are not working. We’ve had enough of the empty promises. Maybe the world was better off before this modern system and its promises. For every advance this system can claim, we only need to look at recent history to see the path of destruction behind its achievement. Before these modern advances, the seat of power of the world was the Nile Valley. This civilization, known as Kemet, united humanity under the leadership of the Pharaohs. This leadership established and maintains the most stable and longest lived civilization in human history. As humanity’s original culture, Kemet provided a system that worked for all humanity for over 100,000 years. Kemetic Civilization is built on the strength and stability of the individuals within it. The citizen of Kemet is called a Kem, meaning black. 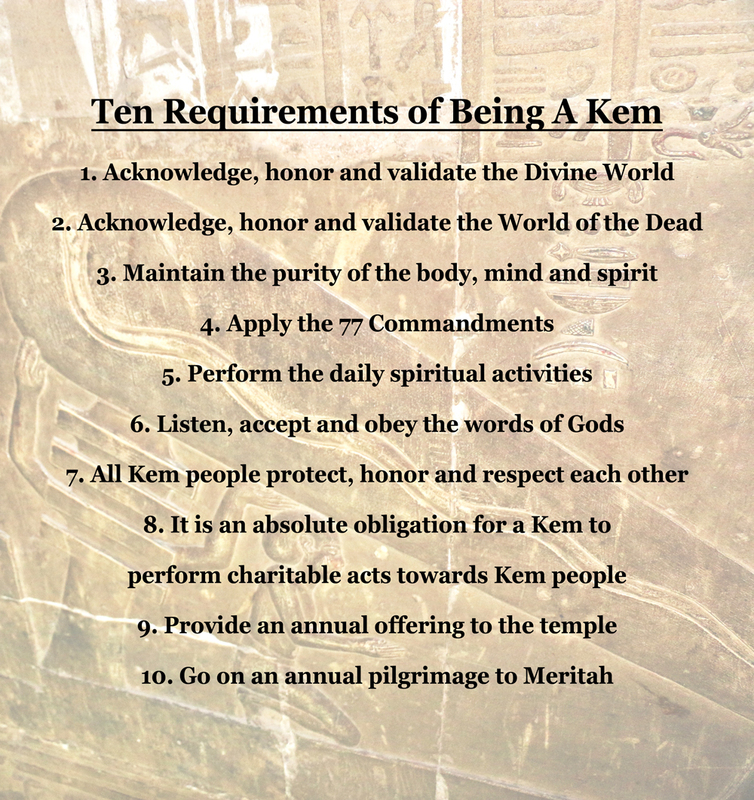 Contrary to popular belief, the title Kem has little to do with skin color as Kemet far predates the idea of race. Black is a color that represents maturity. To become a Kem is to be one who has matured beyond the basic and animalistic human nature and instinct. It is to take command of the emotions and function based on logic. To be Kem is to be responsible for one’s own actions and behavior, to be responsible for the world and its condition. It is to learn from our mistakes, the mistakes of our predecessors and contemporaries, and to avoid repeating them. To be Kem is to be detached from our desires and ambitions with the knowledge that death is a doorway that nothing we own will transcend, except our own history. A Kem lives with a constant awareness of one idea: this life is very short, but it is preceded and followed by many incarnations. Our spiritual future depends on the quality of our behavior at every point in our lives, regardless of the challenges that come. Our physical future depends on the survival of this world. If we will be judged by our actions, not our excuses for them, why will we kill our neighbor for what we will ultimately lose? Why will we destroy the world to satisfy our desires when it is this world that we will reincarnate into? There is simply no incentive for a Kem to do evil. However we may convince ourselves that we benefit from an evil act, that benefit cannot extend beyond the edge of our graves, while the consequences of that evil echo into infinity. The life of a Kem is rigorous, with many restrictions. It is not particularly desireable, but considering the consequences we have seen of abandoning the values brought to the world through Kemet, which alternative looks more appealing? If you too have had enough of chasing the dreams this system has injected in our collective consciousness, do you have the courage to abandon your dreams for something that has been proven to preserve humanity and the world? Do you have the fortitude to withstand the negative reactions of those who prefer the bliss of ignorance to the discipline of a Kemetic life? Until 20 years ago, Kemetic Culture was only accessible in secret initiations in remote parts of the world where these traditions have been protected by the survivors of Kemet. This changed with the opening of The Earth Center and the M’TAM School of Kemetic Philosophy and Spirituality by Prophet Neb Naba Lamoussa Morodenibig in 1996. While changing the lives of thousands of people worldwide, the M’TAM initiation has remained accessible only at the handful of schools maintained by The Earth Center. As we celebrate the 20th anniversary of this rebirth of Kemetic culture, The Earth Center is now in the process of launching an interactive, online learning center for anyone seeking to become a Kem. Visit theearthcenter.org for more information. May your Ancestors put good things in your path and may the Gods give their approval.